I enjoy sharing my wisdom and expertise with others through speaking opportunities. 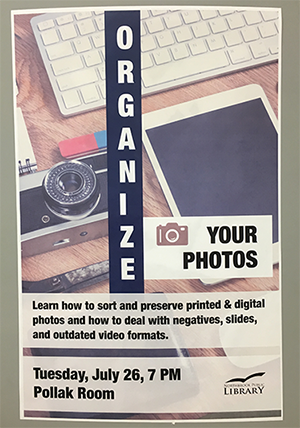 I inspire people to treasure their photos and how to curate and preserve them. Bonnie is amazing. She truly knows her work and how to best help someone really make progress! 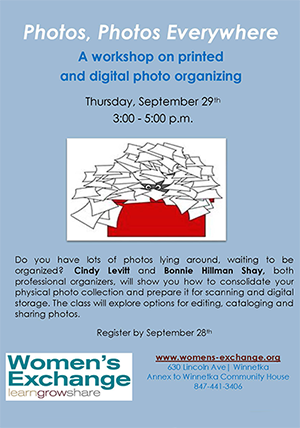 As a facilitator at Women’s Exchange, many women learned how to organize their photos and most importantly, what gets in the way of making the project get finished. Bonnie is truly gifted with helping everyone take steps toward success! 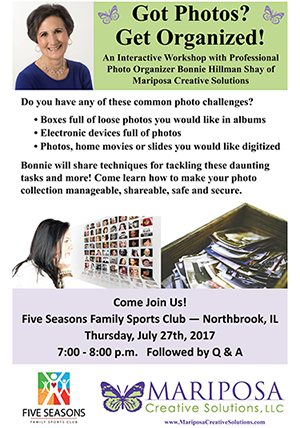 We have invited Bonnie to speak and share her expertise with our patrons on several occasions. She is an excellent speaker and has plenty of tips to share. She delivers those tips in a very professional manner.